The countryside of Plešivica in Croatia is a scene of rolling hills framed by low, misty-blue mountains in the distance. Dotted with terracotta-roofed houses amid fields of sunflowers, corn and vineyards, the silence is broken only by birdsong or the occasional lowing of distant cattle. Bathed in mid-summer sunshine but gently freshened by a breeze, it is an utterly timeless and pastoral scene that betrays nothing of the turbulent past of this young country. Though recognised as an independent nation only since 1992, Croatia has quickly established its own identity. That’s partly due to the popularity of the ravishingly beautiful Dalmatian coast with its historic cities like Dubrovnik and Split, and its 1185 islands. Once more a popular tourist destination, memories of the savage Balkan wars are fading. Last year 10 million overseas holidaymakers spent time in Croatia where they discovered a modern country, yet one with a food and wine tradition based around local ingredients and grape varieties that is very much alive. Whilst there are no major mountain ranges in Croatia’s vineyard areas, many are planted on hillside slopes at an altitude of 300-400 metres. Almost 6,000 kilometres of Adriatic coastline (including the islands) enjoy a warm, maritime-influenced Mediterranean climate, whilst the inland zones stretches east towards the Hungarian and Serbian borders where a Continental climate means hot summers and cold winters. All of that means there is diversity to spare in Croatia’s vine-growing conditions. to the warmer south means a large variety of grapes is grown, making a wide range of wine styles. The inland Continental region is colder overall, making it a haven for aromatic varieties and even icewines. This is also home to the Slavonian forest, source of high quality oak for barrels that are used widely throughout Croatia, but also in wineries around the globe. Croatia boasts an array of indigenous and regional grapes that makes for fascinating drinking. Pošip and Graševina (Welsch-Riesling) are two quite common white wine grapes that can produce deliciously limpid and fresh wines, perhaps in the same idiom as Fiano from Italy, Grüner Veltliner from Austria or Albariño from Spain. But perhaps the most impressive local white wines are made from Malvasia, planted widely for table grape production, but now producing delicious, mineral-flecked wines with body, fruit and great matière. Other common local grapes are Grk and Maraština, Debit, Zlahtina and Traminer. International white wine grapes have taken a strong hold too, with Riesling (Rhine Riesling), Chardonnay and Sauvignon Blanc quite common, and some excellent examples of Pinot Gris, Muscat and Germanic varieties like Sylvaner. Indigenous reds are dominated by the Plavac Mali, capable of some deliciously rich, dark-fruited wines, Babič and Teran. International red grapes include Pinot Noir, where clones are a mix of Dijon and Swiss varieties (and known locally as Pinot Crni), Bordeaux varieties and Syrah. Austrian and Germanic varieties like Blaufränkisch, Zweigelt and Portuguiser are also common in the colder continental region. There is oak in most cellars, both barriques and large oak vats of 3000 litres or more. These are predominantly Croatian oak, though many high-end producers have French oak too. Those plus modern stainless steel form part of the mix depending on the winery, grape and wine style. Croatia’s story has much in common with other countries where communist regimes have fallen. Where once large, state-controlled wineries and generally quite low wine quality was the norm, since the mid 1990s wholesale change has taken place. The thousands of tiny, hobby vineyards farmed by families for their own consumption still exist, but so too do an increasing number of quality-focused private wine estates operating on a small to moderate scale. Today there are around 800 wineries producing wines on a commercial scale from controlled regions of origin. Three quality levels appear on labels, introduced by 2010 legislation: Stolno, Kvalitetno and Vrhunsko. For the top ‘Vrhunsko’ classification the wine must accord to analysis including no chaptalisation, minimum alcohol and extract levels, and passing the judgement of a tasting panel looking for quality and typicity. Styles range from rich, tannic and traditional reds that benefit from considerable cellaring, to much more modern, plush and expressive styles. Whites too run the gamut from very traditional ‘yellow’ wines made with long skin contact and a certain amount of oxidation, to burstingly fresh, fruit-forward styles. Around 65% – 70% of all production is of white wine. Croatia has a young generation of winemakers who have taken over family farms, and like their neighbours in Slovenia, many are embracing organic and biodynamic farming and are making wines that fall into the ‘natural’ category with wild yeasts and no or minimal added sulphur. 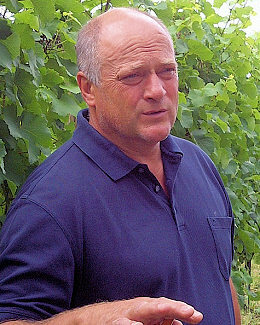 I visited Croatia in summer 2011 as a guest of the Croatian government and wine producers. The main purpose of my first two days in the capital city of Zagreb was to taste and assess 250 Croatian wines, and choose a selection that would be shown at the Croatian wine trade and press tasting in London. Over the next two days I travelled to several wineries within easy reach of Zagreb. That meant missing out on the many estates in the coastal regions of Istria and Dalmatia on this visit, and instead concentrating on the inland, continental Croatian regions of Zagorje, Plešivica and Kutjevo in Slavonia. Brief profiles of these wineries plus tasting notes on over 50 more wines follow. My visit to Enjingi was full of interest, not least because the engagingly grumpy Ivan Koloman (below) seemed so unimpressed by a gaggle of visiting British journalists. But also because just as he was telling us what a magical place his vineyard was, the perfect blue skies and 30C sunshine we’d been enjoying suddenly disappeared, the sky turned black and the most extraordinary storm whipped up from nowhere with hailstones the size of golf balls battering the winery and a swirling, tornado-like wind ripping across the vineyards. Ivan, it is has to be said, has every right not to be phased by press visitors. 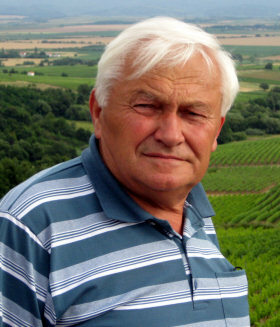 He is a pioneer of quality bottled wines in Croatia, having taken over the family vineyards in 1957 and despite the unfavourable social, economic and political climate, becoming the first Croatian private wine producer. He tells the story of how the communist government would only allow him to bottle wines as long as they carried no variety or other quality indication on the labels, because they did not approve of private companies. He was officially only allowed to sell from his farm, but a few of the best hotels in Zagreb sold his wines for him, agreeing to split the regular fines the government levied on him. Remarkably too, he has been farming organically for 27 years, uses only natural yeasts for fermentation and adds no sulphur during vinification. His philosophy fits the trendy ‘natural wine’ movement to a T, but was a couple of decades ahead of the curve. Ivan took me into his cobweb-covered cellars to taste white wines back to the 1994 vintage, all made ‘naturally’. They were terrific by and large, the 1994 a deep golden hue, but with a fabulous mineral nose and still an apple skin bite of acidity giving balance on the gently toasty palate. The red wines in the range were much less successfully in my opinion, a few seeming excessively volatile and alcohol levels high. A mixed bag for sure, but then we came to a series of late harvest, dry wines that were quite extraordinary. Made too by the ‘natural’ method they included a 2004 Graševina with 16% ABV, a 2006 Sauvignon Blanc with 17.5% ABV and finally a real mind blower: a 2008 Traminer with 19.2% ABV. All of the wines are fermented with natural yeasts and are unfortified. For me some were a little unbalanced, though the highest alcohol Traminer was the best with richness and vibrant acidity. There was plenty of excitement when I turned up to meet Vlado Krauthaker on a beautiful hillside above the winery. The peacefulness of the scene was being well and truly disrupted by the two magnificent plough horses that work these vineyards. The animals had been hanging on past their normal clocking-off time, and with the midday sun scorching they were now stamping, snorting and generally showing their displeasure with the situation. Vlado explained that geologically these are some of the oldest hills in Croatia at over 450 million years old. 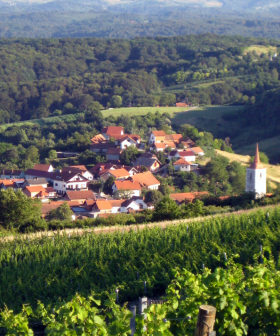 The vineyard region stretches 52 kilometres along the hills and Krauthaker’s portion is worked by horses and farmed sustainably, but not organically. The estate specialises in the Graševina variety, making both dry and sweet styles, and is working with academics on a clonal selection programme which has analysed 250 plants and found 80 that were virus free and so were replanted in controlled vineyards here in Kutjevo. The final outcome of this experiment will be to choose the three or four best clones based on quality and yield. Another new vineyard has been planted with Puglian Primitivo. Vlado (left) explained that it, and cousin Zinfandel were now re-establishing in Croatia, Doctor Carole Meridith of UC Davies in California having confirmed that the Croatian Kaštelanski is an ancestor of Zinfandel. Back down in the immaculate little cellar, Vlado revealed that he has no fewer than 39 varieties planted on an experimental basis. Only ten percent of the production is red wine, mostly Pinot Noir, Merlot and Syrah, and only Slavonian oak barrels are used in the cellar. The cellars have a capacity for around a million litres of wine, but production is maintained at 400,000 litres as “we don’t like to rush the wines.” I have to say Krauthaker’s wines struck me as some of the best in the region, and Mr Krauthaker clearly has an adventurous streak with oak-aged Sauvignon Blanc and a no-sulphur, 50-day skin contact natural wine amongst the cuvées in his portfolio. Marketing Director Igor Hrukar met me at the winemaking headquarters of this large operation where a modern winery sits in front of original 13th century cellars. Six million litres of wine per year are produced from a combination of estate vineyards and those of contracted growers. Kutjevo’s history has been dominated by religious orders. Cistercian monks from Burgundy planted the vineyards in 1232, and religious orders worked the vineyards until 18th century. The winery butts tightly against the beautiful 18th century Kutjevo Abbey, now part of the wine estate. Following a period of nationalisation after the second world war, the Kutjevo operation returned to private hands, and is now part of a group involved in livestock and crop farming too – meaning the winery gift shop has a wonderful array of cold meats, cheeses and sausages for sale. 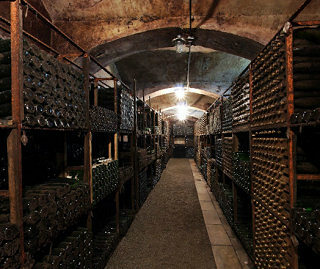 Deep within the 13th century cellars is, they claim, Croatia’s greatest archive of wines (right). Today Kutjevo farms 525ha of its own vineyards, and 350 growers supply grapes on contract, adding another 450ha of vines. The company manages all contract vineyards, with growers paid by variety and quality of grapes, not only by quantity. The more modern winery was built in 1982, and though a large and functional space with none of the beauty or mystery of the old cellars, it is fully equipped with stainless steel and huge Slavonian oak casks. Another highlight for me was the visit to Korak, whose lovely winery has a picture postcard setting, perched on top of the Plešivica hills. But it was the quality of wines that most impressed here, where Velimir Korak (right) runs the company that was founded by his grandfather. 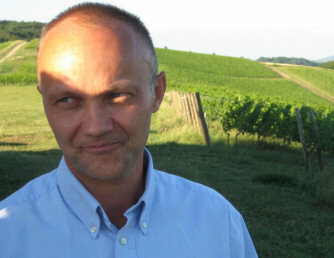 Under Velimir’s direction there has been a substantial switch away from Croatian varieties and replanting with Chardonnay, Rhine Riesling and Sauvignon Blanc for white wines, Pinot Noir, Syrah and Portuguiser for reds “The Portuguiser makes young, fresh wines for early drinking,” he tells me. Though purists may mourn the loss of traditional grapes here, the replanting began 25 years ago and this is high quality winemaking from densely-planted, carefully managed vineyards on a favoured position on limestone and clay hills. The ingredients are there for quality, including 400 metres of elevation giving relatively cool conditions, though there is never a problem fully ripening the grapes. This is a small, 40,000 bottle production and the modern cellar is spotless and organised very efficiently. Mostly French oak is used, especially for Chardonnay, though Velimir tells me he uses more Croatian oak for reds “though it can be very tannic in first use.” Down in the cellar, barrel samples of his 2009 white blend were deliciously fresh and punchy, with lovely vibrant lemon zest and grapefruit flavours, though full bodied through lees-stirring and fruit concentration. Korak is a determined character and this is an unashamedly ’boutique’ winery, aiming for an international style but with something of Plešivica’s signature. Production is small and prices relatively high, but as always the proof of the pudding is in the glass, and these wines are some of the most accomplished tasted on this visit. Tomislav Bolfan (right) is not a son of the soil who inherited the family farm: his business is an electrical installation company that specialises in winery buildings. Perhaps that was a factor in his decision to start his own wine estate, but so too was his gene pool, as his grandparents farmed vineyards which he visited as a young boy. The slopes on which Tomislav chose to plant his 20 hectares have been a wine-growing site for centuries, where marl and limestone dominate. Ten years ago he planted Riesling, Pinot Noir, Muscat and Sauvignon Blanc, as well as small quantities of other varieties including the German Portuguiser. The vineyards are organically certified, but are currently in conversion to biodynamic farming, with goats and sheep providing manure and the cool, windy conditions minimising the risk of rot and mildew. 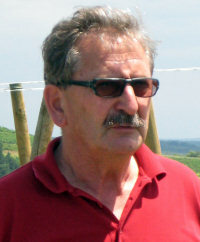 Tomislav says it was his own health problems, which he attributed to synthetic chemicals he worked with, that was the main driver for his conversion to organic farming. An intense but gentle character, he also talks of moving towards ‘natural’ winemaking and is already using wild yeasts for fermentation. The white wines are very good indeed, but I found the Pinot Noir wines to be too extracted and heavily oaked, which rather undermines the lightness of touch shown in the vineyards.